AMAZING!!!! I think 90-95% of the room was engaged the entire 2 hours which is amazing for our group. I have had a tremendous amount of positive comments and new friends were made throughout the evening. I have given our your contact information to several already. Everyone loved the Fun Pianos. They did a wonderful job keeping everyone involved. I would highly recommend Fun Pianos for any event even a Wedding. It was amazing as always! We loved it!! It went well. They were great! We’ve had lots of good feedback! It went great! We’ve heard lots of fun feedback about the party as a whole from our staff – so we are very thankful you guys could be a part of it! The performers were awesome!! I hope we could have them back next year! Yes charge that card. It was a great evening! Your guys were flat awesome! I heard a lot of compliments about how they handled the crowd of varying age categories with kids there but still had a certain level of adult entertainment value woven in! I thanked the guys and was sincere in my thanks for the job they did. I will be recommending Fun Pianos to people who ask me for entertainment ideas!!! We thought it was great! Lots of good comments from our employees. Thanks for making it so seamless to put together! And yes, we really enjoyed the performers! Hopefully we will be booking you next year. AmAzInG! Very fun, interactive and a blast for the attendees. We loved them! Excellent!! We have had nothing but great comments about the show!! The guys did a fantastic job!! It was absolutely amazing! Best holiday party we have ever had! Everybody said it was fantastic! Amazon brings the Fun Pianos dueling pianos show to Banquets at the Boardwalk in Grand Forks ND for their private event on Saturday February 3, 2018! Thank you for everything! The company had such a great time! Everyone was enjoying themselves and the interaction was awesome. Hats off to the duo for everything they did! I definitely would recommend to others! It went well. Lost so f fun thank you for another good year! We just had Fun Pianos back for the third year in a row. Each year we have had a different team and all had a different show and all were great. This event is so popular that people were asking for tickets before we even had them printed. Word was out that this as a very fun event and we sold out quickly. Thanks Fun Pianos!! Talk about a FUN night 10/21/17 at the Rough Rider Center? in Watford City, North Dakota?! Dueling pianos by Fun Pianos sure loved the fun & hospitality of you folks! Many thanks for having us at your wedding reception at the Avalon Event Center in Fargo ND! Dueling Pianos by Fun Pianos loves weddings! Many thanks to the Garrison Park Improvement Project for having the Fun Pianos dueling pianos show at the Garrison City Auditorium in Garrison ND to entertain for their FUNdraiser! This is truly a FUN town! Amazing! Fun Pianos by 176 Keys puts on a fantastic show filled with so much fun. I especially love how much they get the crowd interacting and involved in the show. What a great fundraiser & night out for our community! If you’ve never seen a fun pianos show before, you are missing out. We are excited the day is finally here this week! We are looking forward to being with the Williston Downtowners Association this Thursday 8/17/17 at the Summer Nights series! Look for us from 5 – 9 pm! Was a great time – good time had by all I believe! I think the guys had a great time as well – pretty lively bunch! It went very well. I have heard very positive things from everyone on their performance. What a fun night! The players did a fantastic job!! Those who were there had a blast! It was fantastic! We sold 340 tickets and made over $11,000! The piano players we had were very professional and so much fun! We look forwarding to booking again for next year! Just wanted to let you know that we had a great time with Fun Pianos on Wednesday. One of the Veterans told me “that was the best entertainment we have ever had.” It was a great day and they both did an amazing job. Thank You for your part in it as well. It went very well. All the employees had an excellent time. Thank you for everything! I wanted to say THANK YOU for a fun and memorable evening. I know we had a different crowd, but I have heard from nearly everyone that attended that they loved you guys! Everyone is hoping that you become the regular entertainment for banquets to come. The show was absolutely wonderful! We have heard nothing but positive comments. People are asking when we will bring Fun Pianos back. Huge success! The show went really well. I received many positives on the players and the whole entertainment package! Both were very professional and easy to work with. Thanks again for all your help, this whole process was very easy! The show went really well and our team really enjoyed it! I think like most groups, it took them a little bit of time to warm up, but by the end of it they were all having a great time. Your team did a great job! The evening was such fun! We only had about 130 people there because so many were already in the field. But they did not disappoint ! Hope they also enjoyed the evening ! Thanks for all your help in making arrangements! Thank you so much!!! We had a blast and they did Wonderful!! The party was great! Everyone had a blast and really enjoyed themselves. The two performers were absolutely wonderful – they were so fun and did a great job reading the crowd! Thanks again for everything! The show was awesome – our employees are still talking about it! George and Matt were so talented and easy to work with. I have already told so many people about you, just trying to find another event now so we can see the show again! Thanks for checking in and for an organized, smooth event! The show went great. We are getting some great feedback from our students. Tell the piano guys that they did an awesome job. Just a short follow-up from our Volunteer Appreciation event. All went well and smooth! Had many great comments on the Fun Pianos and they really made our event a success! Please share again with Sam my most sincere appreciation in working with us to make this happen. I’ve heard from several employees that they thought it was our best party ever! Finley Farmers Grain & Elev. Co. I was not there but once the performance started I had my phone handy in case there were any questions. I received 13 texts and 9 videos from staff stating how fun it was and how great it was going. When I got back the following Monday that was the talk at all 5 salons. Everyone really enjoyed it. In my 17 years of being here we have never had them talk about how great the Christmas party was. So, I would say you nailed it. It was great! The team was wonderful to work with! It certainly added new and fresh entertainment for our event! Thank you so much! Awesome. Everyone wants them back! Wonderful! We had a great time and everyone really enjoyed the guys! Thank you so much and thank them for us. Just wanted to say thank you to the guys for such a fantastic show!! We received several compliments that night about bringing in such great entertainment and providing something unique to Dickinson! We also received an inquiry for your contact information to book a potential Christmas party for the upcoming year. Thanks again and have a wonderful week! Everything went great! We have had so many great compliments on the event and the Fun Pianos dueling pianos! I was told by one employee’s wife that when she got home that night, her face hurt so much from laughing. She said it was the best Christmas Party we had ever thrown. Thank you very much for working with us and we would love to have you back another year. I will be in touch. Well, I’m starting to recover if that tells you anything. One of our guests (a 30-something guy & relative from the East Coast) told me it was the best reception party he had ever been to, ALL things involved, which made me feel great, since I was the main planner, decorator, bottle washer, etc-LOL. The players read the crowd so well & stayed in an extremely appropriate show, with enough child interaction & adult content for the ones that enjoyed that part of it. Both the little ones AND the older guests had a BLAST! They did a great job “M.C.ing” the Grand Entrance, & picking people out of the crowd. That actually took pressure off of me, knowing they would handle all of that! The next day, we had the “worst blizzard” of the winter hit the valley, and we knew it was coming. Some of our guests left early to get back on the road. But those that stayed almost wouldn’t leave – haha!! I’m so glad, in a way, that we did not have any longer of a show. I was satisfied with the length and ready to call it a night by the time the DJ part of the show finished. I couldn’t believe all the dancing that occurred during that part of the night, young and old! Thank you for to everyone involved for your professionalism, communication skills, talents and personalities! I will recommend you for future events. I hope people can “get past” the cost – what I would say to them is – cut out chair covers, special linens, huge decor, etc and ENTERTAIN YOUR GUESTS!! We had a great time! I heard nothing but good comments. I could not believe that they got everybody going so quickly. Thank you so much for working with me on this. We hired 176 Keys as part of a benefit fundraiser in our community. All I can say is ‘WOW’! Sam and George put on an amazing show. I was still working in another building across the fairgrounds when the show started and from the very start I could hear the crowd roaring from far away. This is by far the best entertainment a person or group could hire for their event. Hats off to 176 Keys and thanks for helping to make our event an overwhelming success! It was great working with you guys and the show was excellent. I have heard numerous compliments in the days after of what a fun time everyone had and didn’t want the show to end. You guys are a class act and we would love to have you back again in the future. The conference was a great success and I directly attribute that to the fun and entertainment you guys provided. The guys were so awesome! Our crowd had so much fun. I was so impressed and they truly made our event the best in a number of years. Thanks again! …I run into people they definitely comment on how fun the dueling piano show was! I’ve heard all about “the dueling piano show” from people that didn’t even come to the wedding (so that tells you what people are talking about….small town)! We had a great time, and hope the guys did too. North Dakota has become a real home to us. Holiday party season and warm weather season have us bringing so much FUN to North Dakota, we have set up shop in the area. Here are some highlights from a few of our shows there over the past year or so. Included in the cities that love the Fun Pianos Dueling Pianos show: Bismarck, Valley City, Kulm, Larimore, Minot, Devils Lake, Lisbon, Fargo, Mountain, and more. Two shows have already booked for NEXT December in North Dakota. It’s no B.S. when we say some dates fill up FAST and far out. The Fun Pianos dueling pianos show in Fargo has shown that we are just a couple of guys yelling out songs and hoping the audience will sing. Dueling pianos in Bismarck, Fargo and throughout North Dakota and the whole country with Fun Pianos is an interactive FUN show with laughter, and entertainment beyond just (hopeful) singalong. If it isn’t FUN PIANOS, it isn’t FUN! Big holiday dates for NEXT year ARE filling up NOW! 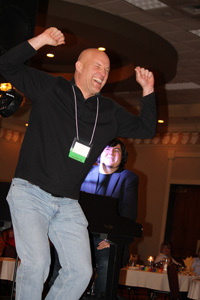 176 Keys Fun Pianos Request-Driven, Mega-Interactive Dueling Pianos were a hit in Bismarck, ND!